OK, I admit it, I’m slightly infatuated with the Archos brand, as I’ve never found another PMP designer that has managed to combine everything a user might want into such a sleek shell. The latest Archos news to whet my appetite (and cause my bank manager sleepless nights ) is that of the Archos 9. Following on from the adored Archos 7 and Archos netbook announcement is the rather stylish looking Archos 9, which tried to be the best of both the PMP AND the netbook world. 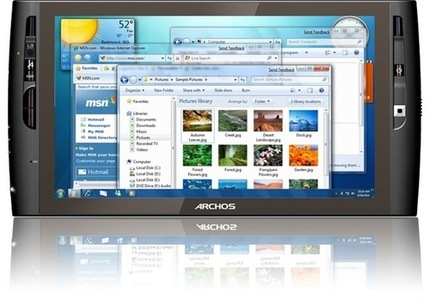 The Archos 9 is a very stylish piece of kit which boasts a glossy looking 9 inch screen. They’ve bundles in a Z515 Intel processor, Windows 7 OS and a hard drive of up to 120GB. It’s a mere 0.63 inches thick and features a resistive screen for easy touch browsing. If it’s anything like their other models you can be assured this will be a dream to use, as this is one area they really excel in. They’re moving beyond merely media functions though as the Archos 9 can be used to read and send emails, compose documents and even manufacture spreadsheets (though I’m not sure if you’d want to on that screen). They’ve included an optical trackball with two buttons so you have two ways of navigating content, though a 360 trackball like the HTC Magic has would have been a nice inclusion. You also get Bluetooth 2.1, Wi-Fi and the Archos 9 even has two antennas with a dual tuner so you watch and record Freeview TV on the move. For those who dislike touchscreen tablets,, you also get a external case and a keyboard to play with. Available from Q3 this year with a 12 inch version out in 2010. No price so far, but knowing Archos, it won’t be cheap. Great! I can use it to browse http://www.hongkongtourmap.com easily on the road. I saw one of these at a computer show. I totally want one. I think I may opt for the external case and keyboard. Wow. I really like the Freeview TV feature. Is there any word on how much one of these costs?